In 1897, the heirs of the late William G. Perley conveyed the family property on Wellington Street for the care of persons who needed shelter and treatment over an extended period. When the Perley Home’s property was expropriated in 1912, a new facility was built on Aylmer Avenue. By 1941 the Perley’s capacity had grown to 95 beds, and in the 1950s it was further expanded to 215 beds. As a hospital, the Perley took on added responsibilities for physiotherapy and orthopedic rehabilitation. The Rideau Veterans Home (RVH) was built by the federal government as a temporary residence for the rehabilitation of service personnel returning from the Second World War. It gradually grew into a 139-bed home for the aged. 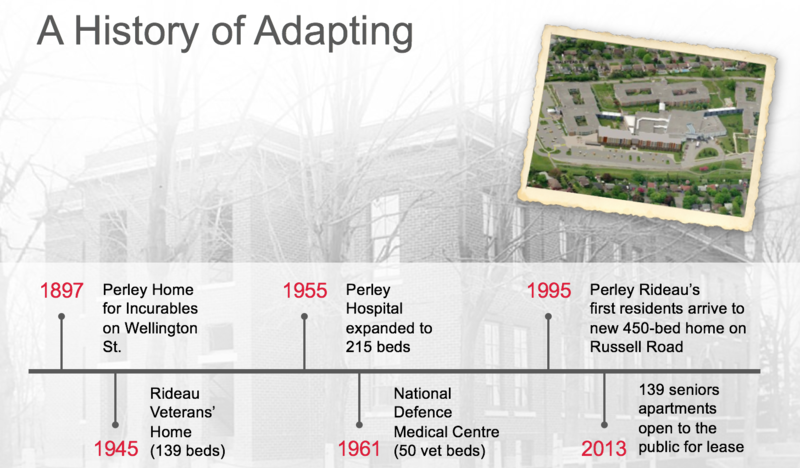 In 1988, the Perley Hospital was invited to submit a project plan to Veterans Affairs Canada to combine with the RVH and the Veterans Wing of the National Defence Medical Centre to construct a new 450-bed facility. Construction began in 1994 with financing shared among Veterans Affairs Canada (55%), Ontario Ministry of Health (30%), Regional Municipality of Ottawa Carleton (10 %) and a community fundraising campaign (5%). The first residents moved into the new facility in 1995. In 1997, the Ministry of Health designated the new facility as a long-term care home. Supplementary Letters Patent dated December 29, 1999 were issued. These provisions changed the name of the corporation to The Perley and Rideau Veterans’ Health Centre, and permitted the Health Centre to solicit and receive donations, bequests, legacies and grants as a Registered Charity with the Canada Revenue Agency. In providing the highest practicable quality of life for its residents, The Perley and Rideau Veterans’ Health Centre has always depended on charitable contributions and volunteers to support the well-being of its residents.